Bleecker Street, the latest Bond No. 9 scent, was named after the new Bond No. 9 boutique, their fourth in New York. The story goes that the fragrance was meant to be a gourmand scent evoking the smell of cakes, namely cupcakes from the famous Magnolia Bakery. Perhaps the plans have changed in the process or the cupcakes in question are a new, hip, urbane New York kind, spicy and herbal rather than sweet and vanillic. The fact is that Bleecker Street does not evoke any (known to me) baked goods and is not a gourmand scent in general. Anyone who knows the details about the concept behind the fragrance and what happened to those cupcake plans, please comment. I can imagine that some people, having been lead to expect a sweet gourmand scent, will be disappointed in Bleecker Street. Have I not heard the reports about the scent’s herbal, unisex, non-sweet nature from those who have tried the new Bond No 9, I might have felt let down as I do like gourmand fragrances. But I also like quality unisex scents that are fresh without being aquatic or overly green, and that is precisely what Bleecker Street is, to my nose. When sniffed directly from a sample vial, the scent seems to be quite masculine, a ubiquitous “male cologne”. However, applied to the skin, it immediately loses the masculine edge. It is not a feminine fragrance by any stretch of imagination, but it does fall very neatly into a unisex category. Bleecker Street starts citrusy-green on my skin, with almost a vague aniseed accord to it. It grows greener by the second and, strangely enough, the scent makes me think of young, unripe cucumbers with their raw, dark green, and astringent scent. Cucumber is normally not one of my favorite fragrance notes, which is I why I am rather shocked that I like this note so much in Bleecker Street. Having said that, I must make a disclaimer that there is NO cucumber note among the official list of the ingredients (violet leaf, cassis, thyme, jasmine, cedarwood, cinnamon, oakmoss, suede, patchouli, amber, vanilla). Skin chemistry works in mysterious ways. Patchouli is one of the notes that never fails to become the most prominent on my skin, but in this case it is absolutely non-existent. As are cinnamon, suede, amber and vanilla. Having seen the base notes, I fully expected Bleecker Street to drastically change its character right after the middle stage, to lose its dry, green, herbal nature and to dry down almost a la New Haarlem, dark and sweet, with patchouli and vanilla overwhelming all other notes. Not so. This is the first fragrance where the base notes never show up on my skin. Bleecker Street stays darkly green, fresh, and dry all through its development, until it disappears some 6-8 hours after the application. 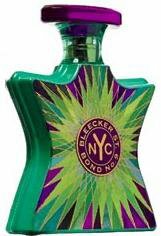 If I had to compare Bleecker Street to any other scent, I would say that it is somewhat along the lines of my beloved Violette Precieuse (with the violet notes taken out). Bleecker Street has the same composed, elegant, dry, green quality about it. Bleecker Street is not a scent I would want to wear in cold weather, but I imagine it would be great come spring and summer and this is when it may become full bottle worthy for me. It also seems to me that this fragrance would layer wonderfully with sweet, vanillic, gourmand scents. Bleecker Street can be found in Bond No 9 boutiques, or, among other places, at lusciouscargo. It retails for $185.00 for 3,3oz. ** Many thanks to C. for making it possible for me to sample Bleecker Street and a dozen other Bond No. 9s! Mwah!!! M, we are opposites: I get no aquatic notes from Do Son, and heavy aquatic notes from Bleecker. Don't understand it as they are not listed in the notes, but that is what I smell: green notes, aquatic notes, and a little tiny hint of the promised cupcake thing. 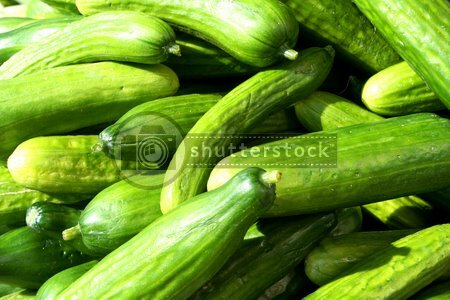 Cucumbers... I love the taste (especially with some tomato and sunflower seed oil, served with mashed potatoes), however I am not a fan of cucumber notes. In Bleecker Street, I get something that reminds me of fresh batter, not cooked, but even that is subtle. It is pleasant, but very different from what I expected. As for Bleecker, it was different from what I imagined it would be either. And I am suprised I like it as much as I do. I get a weird cucumber thing from Lanvin Vetyver (new version, but def. not from the old), too, it isn't listed in the official notes either I don't think. You're right, skin chemistry is a funny thing. I actually rather like a touch of cukes in scent, but I tend to prefer that more in candles than in stuff to put on my skin. Nice review, M, really gives me a good feel for how the scent smells without even having tried it yet. Dear M - The cucumber note is from the violet leaf absolute ;-) I know, it seems strange, but violet leaf is incredibly cucumber-y. That said, i don't need a cupcake scent -- it will make me sad. I live in cupcake-less Miami, where cultural differences dictate pastelitos, Jamaican, Haitian or European pastries, but no cupcakes except the strange styrofoam things in the Publix store. One old-time Jewish bakery on the Beach has some, but they're awful. Even reading this made me nostalgic and started cravings. Gourmand scents and their descriptions are funny like that! I am sure many will appreciate your early warning about the cucumber-y scent, though. How strange the disconnect. oh dear. Cucumber is a show stopper for me! ick. For me too, always! Except here somehow...strange.